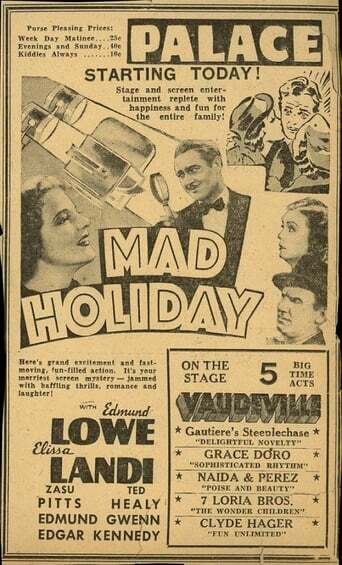 The overlong but absorbing MGM "B" melodrama Mad Holiday stars Edmund Lowe as vacationing movie idol Philip Trent. Tired of starring in murder mysteries, Trent discovers he can't escape typecasting even on an ocean voyage: one of the passengers is murdered in our hero's cabin. The killing is tied in with a stolen diamond and a seemingly unending supply of suspects. To avoid being arrested himself, Trent teams up with pretty detective novelist "Peter" Dean (Elissa Landi) to solve the mystery. 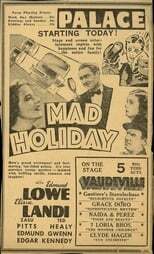 As Trent's wisecracking press agent Mert Morgan, Ted Healey has a wonderful moment when he stumbles over a corpse and asks nonchalantly, "What's the matter with him, he crocked?"